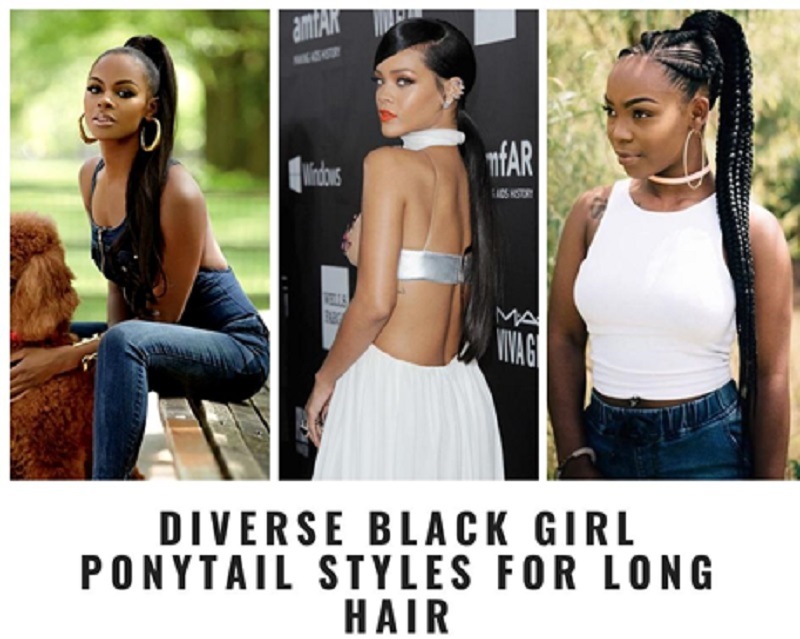 It is known that long hair requires more styling time and effort to look great, but most black women disregard all difficulties and wear long hairstyles which can help to underline their individuality and natural beauty. In 2018, a ponytail is a major trend, chosen by various fashionistas all over the world. This hairstyle may be either traditional or latter-day but, in any case, it always looks gorgeous! Check out this collection of ponytail hairstyles for black hair, and choose the one that will emphasize your beauty and express your personality! If you a fan of braids and polished hairstyles, then a braided ponytail is a win-win option. Cornrows are always a great idea! So, have cornrows on the head to draw attention to your facial features, and gather your long, braided tresses into a high ponytail. You can use extensions if you want. Undoubtedly, this hairstyle looks chic! If you want to have something exquisite, then you can combine different colors and textures in your hairstyle. For instance, have the top layer of your crown braided and incorporate it into a high ponytail. Make sure the hair on the sides and the top is slick, except for curly wisps near your ears, which add playfulness. As for the ponytail, have it curled and fix with a setting spray to make sure the hairstyle lasts for the whole day. If you strive for a sassy look, then this hairstyle is what you need! If you have long hair, then use a hair iron to make it sleek and glossy, but if you want to add some length, you can use hair extensions. Gather your hair into a low ponytail, and comb the bangs on one side so that it covers one part of the forehead. This will not only look stylish but also hide such a flaw as a broad forehead. Add such accessories as earrings or piercing, and you will look flawless! If you want to emphasize your facial features or put an accent on your makeup or accessories, then a simple high ponytail hairstyle should be considered. The crown should be slick, and the ponytail should be high. To hide the hair elastic, wrap a strand of hair around the elastic and secure it with bobby pins. To add a touch of romance, you can curl your ponytail. Do you want to be in the spotlight? Add some color to enhance your appearance and express yourself! Go for bright colors that flatter your complexion. For instance, make a high ponytail and add purple extensions. This will look amazing! Shine bright like a diamond with this amazing hairstyle! This is a perfect way to combine different textures in a harmonious ensemble. An asymmetrical forelock beautifully frames your face and enhances your beauty. It can either hide your flaws or emphasize your virtues, for instance, your eyes. Curl your ponytail, then make the high ponytail voluminous by teasing it with fingers or combing. With this fascinating hairstyle, you will get a perfect evening look. Natural beauty is a trend in 2018! If you want to embrace the natural texture of your hair, then a high ponytail is a perfect way to do it. Gather your curls into a high ponytail and secure with a hair accessory to add a zest to a hairstyle. To achieve a harmonious look, complement it with matching accessories (earrings and a necklace). The overall look will be gorgeous! This hairstyle has its vibe and charisma! A messy hairstyle adds playfulness to the look, and this hairdo is really charming! Have your locks curled, then tease them a little bit, and fix with a setting spray. After that, gather your hair into a high ponytail and disguise the elastic with a strand of hair. This haircut may be both a part either of a festive or casual look. The juxtaposition between the sleek and shiny top with severe middle part and airy, voluminous tail is pure glamour. To achieve this glamorous look, you should use gel or mousse to smooth down your hair on top, then gather the rest of your hair into a low ponytail. After that, you should backcomb the ponytail and boost up the volume. You can complement this hairstyle with a sophisticated hair accessory or you can keep it low-key. This hairstyle is suitable for both everyday life and festive events. With this hairstyle, you will turn heads! This sophisticated hairdo is easy to maintain, yet it looks amazing. If you have long hair and want to create an unusual hairstyle, then wear a forelock, combed to one side, make a high ponytail and braid it. Leave some texture on top so that it remains voluminous. Braid a small plait and wrap it around the ponytail, this small detail will make the hairstyle more appealing. Thus, ladies with long hair can choose any of these hairstyles to emphasize their style, chic, and sexuality.